Beginning on June 11th is Santa Clarita Public Libraries’ Summer Reading, through the 28th of July. Stop in the library or sign up here in order to participate throughout the summer; we have great programs and prizes in store! As in years past, challenge yourself to read at least five books over the course of the summer, logging them on the site as you read. You can even put up reviews to tell others what you thought of the book! Log five books and you can take home a free book of your own! There’s also a ton of missions along the way! Missions are little side objectives you can participate in along the way, anything from checking out our language learning database to downloading some free music from our website to attending certain teen programs throughout the summer. 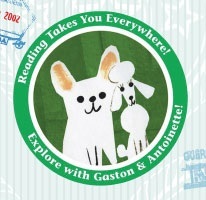 We’re excited to take you on a journey through the summer to show you that Reading Takes You Everywhere! reading takes you everywhere, SRP, summer reading, Teen Programs. Bookmark.